According to the Darke County Sheriff’s Department, a gray Pontiac G6 was struck in the front passenger side by a maroon Honda Odyssey minivan attempting to pass on the right side of the vehicle. GREENVILLE — A two-vehicle injury accident Friday afternoon left two people transported to Wayne HealthCare for their injuries. 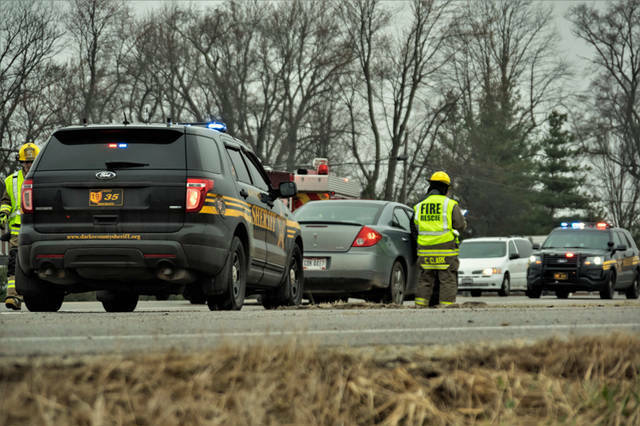 At approximately 3:35 p.m., emergency personnel from Greenville Township Fire and Rescue along with deputies from the Darke County Sheriff’s Department were called to the area of U.S. Route 127 and Horatio-Harris Creek Road on a two-vehicle injury accident with possible entrapment. According to the Darke County Sheriff’s Department, a gray 2008 Pontiac G6, driven by Douglas Hufford, 28, of Greenville, was traveling northbound on U.S. Route 127 when it slowed to make a right-hand turn eastbound onto Horatio-Harris Creek Road. 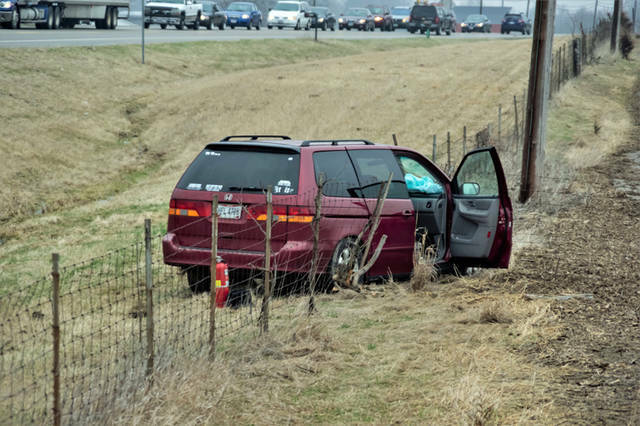 Hufford’s vehicle then was struck in the front passenger side by a maroon 2002 Honda Odyssey minivan, driven by Amanda Ruby, 30, of Greenville, that was attempting to pass on the right side of the vehicle. 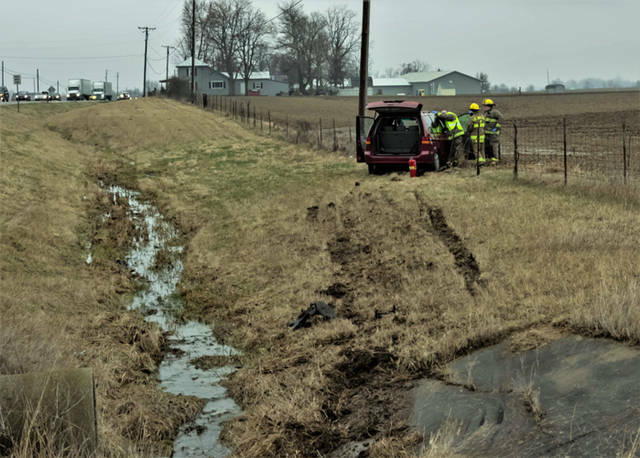 The Honda was forced off the right side of the roadway where it continued to travel through a large drainage ditch before coming to rest after making contact with a fence at the edge of a field. 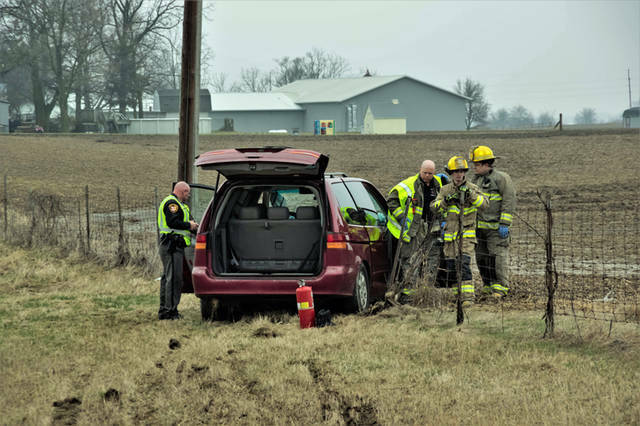 The front seat passenger of the Honda, Jasmine Byrd, 28, of Eaton, had to be extricated by non-mechanical means from the vehicle by Greenville Township Fire and Rescue before being treated on the scene and transported to Wayne Healthcare for her injuries. Ruby, who was found to be at fault for the accident, also was treated on the scene by Greenville Township Rescue and transported for minor injuries. A juvenile rear passenger of the Honda was uninjured in the accident and was removed from the scene by the father. Hufford was examined on the scene by EMS but refused treatment and transport to a medical facility. This entry was tagged crash, Darke County Sheriff’s Department, Darke County Sheriff’s Office, Greenville Township Fire and Rescue, Greenville Township Fire Department, Greenville Township Rescue, Wayne HealthCare. Bookmark the permalink.